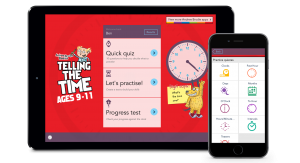 Guest post from Andrew Brodie about creating the award winning Mental Maths apps and the very new Telling the Time apps, launched only last week. Work over the past couple of years means that Bloomsbury now have an established app series, Andrew Brodie Basics, with 9 apps and (so far) two major awards. Having established routine procedures for writing and publishing educational books, the new process of creating apps involved a steep learning curve. My ascent of the curve was greatly assisted by the team at Aimer Media who guided me throughout, so that together we were able to produce apps that were both attractive to children as users and appealing to parents and teachers as buyers. Most importantly we were able to imbed fundamental educational ideals into the apps, which were designed to enable children to practise their maths skills. 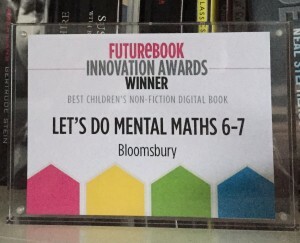 The first set of apps covered Mental Maths. 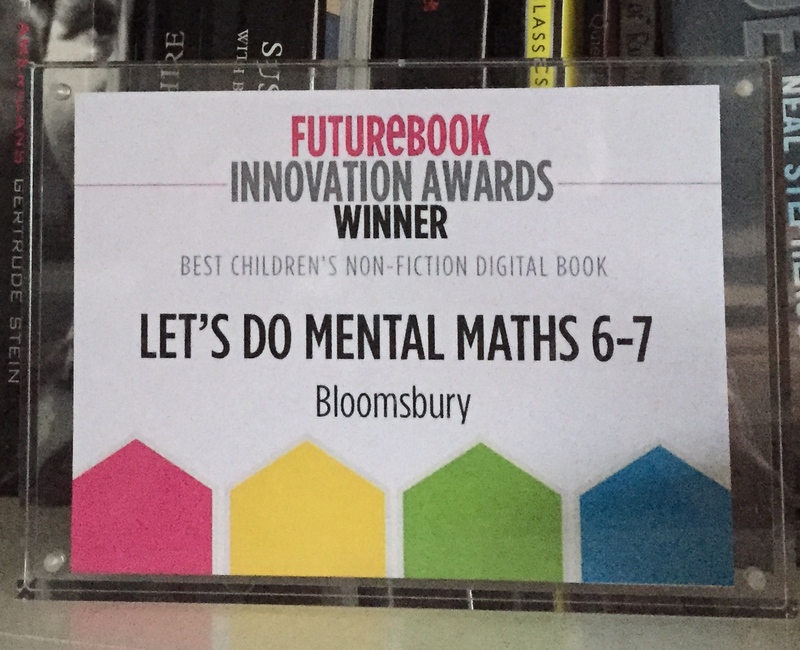 Each of the Mental Maths apps are matched to the National Curriculum as appropriate for specific age groups per app but contains enough variety to appeal to children of all abilities. Children, if necessary guided by adults, can decide which aspect of maths they would like to practise and can then easily find practice questions for this area of work. 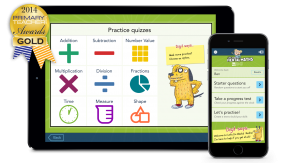 The apps feature materials for all aspects of number work, including addition, subtraction, multiplication, division, fractions, but also materials for time, shape, length, money, area and volume. For most of the activities the child can choose the level at which they want to start then, as they gain confidence, they can step up a level. Everything can be accessed using standard phone or tablet processes such as swiping, tapping or scrolling. If the child needs help, the cartoon character Digit the Dog will provide some options to make a question easier but, importantly, some thought is still needed to identify the correct answer. It was clear that the children find the activities highly motivating and are keen to gain good results and improve their scores. Adults can track the scores to identify both strengths and areas for development. Teachers have embraced it and we have had a large number of apps purchased for use in schools. Responses from children, parents and teachers have been very positive and we took this forward into planning the 3 Telling the Time apps. Unsurprisingly time is a very different concept for many children to deal with. However, the new National Curriculum makes clear demands regarding what the children should be taught about time as they progress through primary education. Even at the earliest part of their schooling, pupils are expected to measure time in hours, minutes or seconds. They should tell the time to the hour and to half past the hour and they should be able to draw the hands on a clock face to show these times. By the end of Key Stage I, the pupils should be able to tell the time to multiples of five minutes, recording the times in writing or on a clock face. At Key Stage 2, children should be telling the time to the nearest minute as well as learning to convert between analogue and digital 12-hour and 24-hour clocks. They need to be able to solve problems regarding time durations, converting hours to minutes, minutes to seconds or weeks to days where necessary. To be able to meet all the demands placed upon them the children need supportive, non-threatening materials, which allow them to learn from any mistakes they make and to move forward confidently. Apps that respond in ways that are familiar to them are ideal for this purpose: children working on an iPad can experiment without fear of criticism, quickly identifying logical patterns and using these to step forward in their learning. So now we are standing at the top of the learning curve we needed to slide down a bit to complete the development of the next apps for other areas that Andrew Brodie Basics covers starting with Spelling. With Aimer’s help this will not be a difficult task.